Misfits mount another amazing comeback. In their first match-up since the 2017 Summer Split semifinals, Misfits once again proved their superiority over Fnatic. Misfits fell behind in the early game but had a successful comeback, something they have done multiple times already this split. Fnatic got a favorable draft after they picked up the newly buffed Nunu and paired it with an Azir—due to Azir benefiting greatly from the AP damage increase on Nunu’s Blood Boil that was added in Patch 8.2. 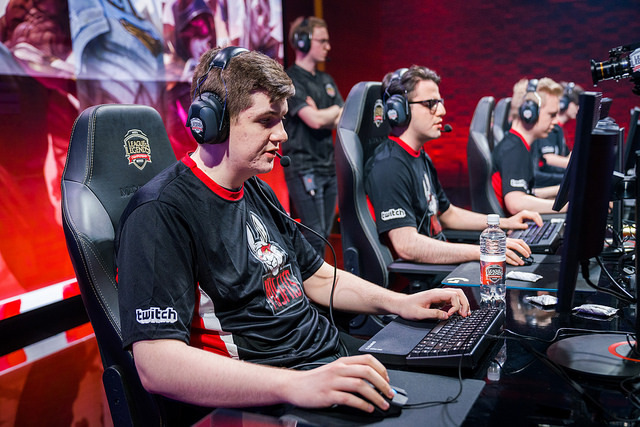 Misfits went for more of a late-game scaling composition, picking up Kog’maw and Gangplank. The early focus for both teams was on the mid lane as both junglers looked to make an impact. Rasmus “Caps” Winther outplayed both Chres “Sencux” Laursen and Nubar “Maxlore” Sarafian to avoid death and take kills instead. Caps’ lane dominance gave Fnatic an early game lead. Fnatic continued to roll their lead into the mid game and eventually took down Misfits’ turrets with the help of Nunu and the Baron. Misfits never lost their cool and kept themselves in the game, allowing their top and bot lane champions to scale. The game turned into multiple fights where there were only one or two kills, as both teams were hesitant to fully commit to a fight and instead would back off. Misfits could not over-chase fights because their inhibitors were down and there was the constant threat of a backdoor. Fnatic could not end the game due to the strength of Misfits’ late game carries. They constantly pressured Misfits’ base to have control over the rest of the map and keep themselves ahead. Fnatic danced around Misfits’ inhibitors, dragging them from one lane to the next in order to create space on either the top or bot side. This allowed Fnatic to take down the inhibitors time after time while keeping Misfits holed up in their base. Misfits dragged out the game, and because Fnatic were trying to push further into Misfits’ base, this meant some Fnatic members were occasionally out of position. Misfits took advantage of this and got sporadic kills to stall the game further. Though they were able to get a few kills, Misfits could not push out of their base for long and Fnatic kept up the pressure. The fight that ended the game took place in Misfits’ base. Fnatic engaged onto the carries of Misfits but did not properly lock down those carries to prevent them from doing damage. Misfits ADC Steven “Hans sama” Live had fantastic positioning that allowed him to take down the members of Fnatic. The fight resulted in a clean ace for Misfits. Misfits took the opportunity after the fight to charge down the mid lane for the win. Though they had not taken any turrets in Fnatic’s base, they were able to push down the remaining turrets quickly because of their Baron buff. Fnatic were unable to defend the push because of their minute-long death timers after the catastrophic fight. Misfits took down the Nexus at the 64-minute mark, capping off a marathon game where their fantastic shotcalling and ability to remain calm while on the back foot really shone. Misfits once again move into a first place tie with Giants Gaming and Team Vitality, while Fnatic falls to a sub .500 record. Tomorrow Misfits will take on another strong roster in Splyce, and Fnatic will play Team ROCCAT in a mid-table clash.